Patented PinSeeker Technology notifies you when the device has calculated the precise distance to the flag. Some might find x zoom magnification somewhat short. 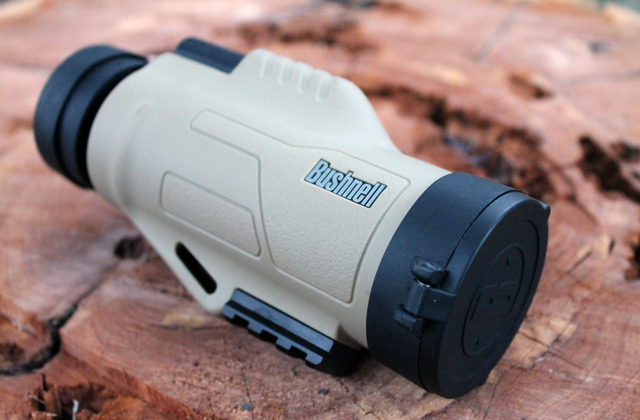 This Bushnell rangefinder can pinpoint the distance not only to flags but also to any other objects on the field with absolute precision. As it doesn't have a slope feature, it's also suitable for some pro tournaments. 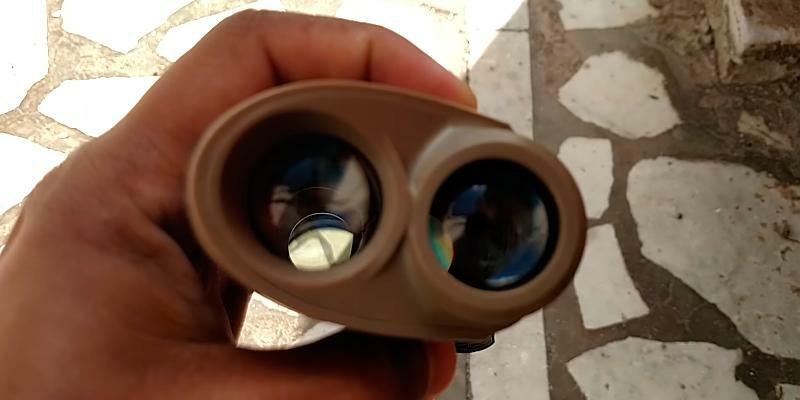 This rangefinder provides the option to change eyesight from +4 to -4 dioptrics and has the eye relief of 18mm, which increases usability even while wearing glasses. It isn't very good at detecting very small objects. You can easily improve your accuracy and proficiency with different ranged weapons with this excellent multipurpose hunting rangefinder. Apart from being supplied with microfiber for cleaning the lenses and a special strap for comfortable carrying around your wrist, this rangefinder features a smart scanning mode. Sometimes detects the wrong object in Pin mode if there are many background hazards. A solid rangefinder, that utilizes advanced technologies of laser scanning and auto targeting. This device is efficient and comfortable to use during both golfing and hunting. It allows for continuous scanning, providing distance measurements to different objects. 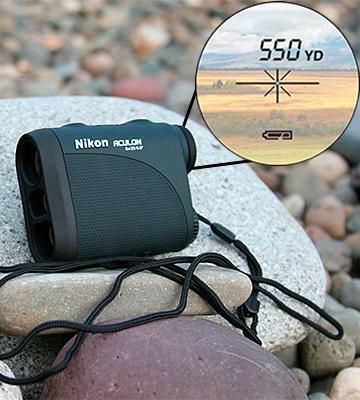 This compact and light-weight rangefinder is made of pretty durable materials. A small size of this rangefinder impacts the stability while holding it in hands. 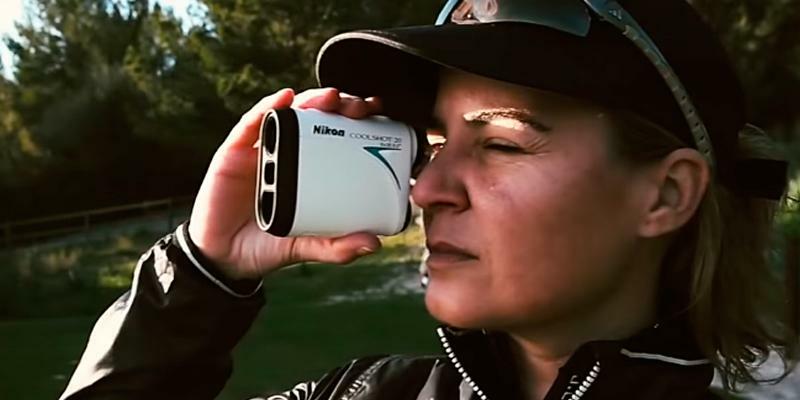 Nikon rangefinder will definitely help you improve your results in playing golf. 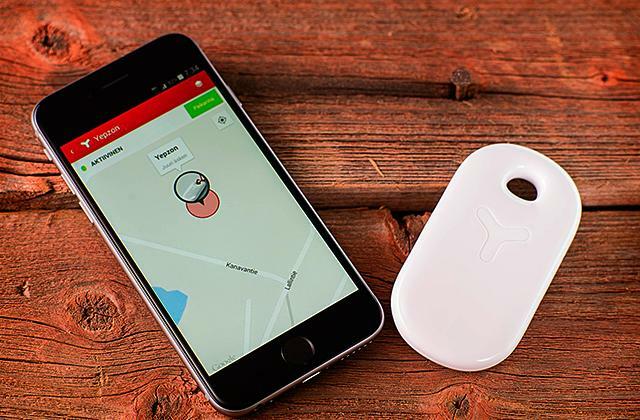 It can measure exact distance to different hazards, such as trees or bunkers, despite possible interference from green grass. 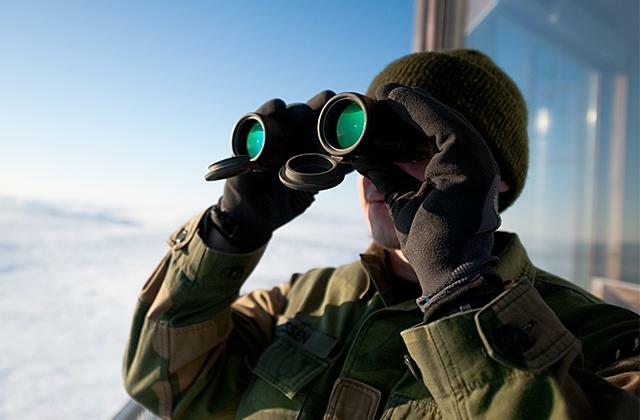 Military color design decreases chances of being detected. This rangefinder comes for a reasonable price and has an option to scan different objects in a wide field of view. Bushnell Tour V4 Rangefinder is an ideal choice for active golf players and enthusiasts that play on the large fields with various hazards. It can effectively measure the distance from 5 up to 700 yards to most of the objects on the field, including trees, hazards, bushes, and other things. With highly reflective materials and objects, the range is increased up to 1000 yards. In other words, the flag does not necessarily have to be with a reflector in order to measure the distance to it. Another special feature for golfers is the Bushnell's PinSeeker Technology™. Basically, when a flag appears in the view and the device has measured the distance to it, the slight vibration will notify you about it. That way, you can be sure that you've got the right distance to the flag and not to any other object on the background. 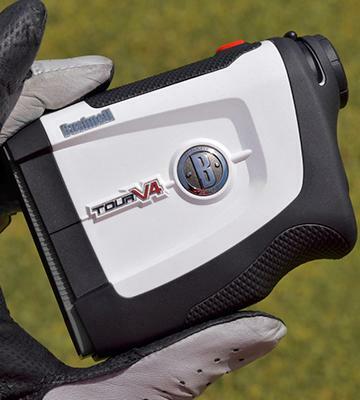 Along with advanced measuring technologies, Bushnell Tour V4 has a great ergonomic design with balanced weight. It has a nice grip and all the functions can be controlled with just one hand. Actually, there's not so much to control - just the on/off button and the focusing wheel for the eyepiece. Speaking of it, the eye relief is pretty long - about 0.7" from the lens. Add to this the fact that it has only 5x magnification, and you will be able to quickly scout the whole course for the hazards, bushes, and flags. It's worth mentioning that the pinpoint accuracy can be strongly affected by the dust and dirt particles on the objective lens. Therefore, don't use your shirt to wipe it off, as it will scratch the glass. Just try blowing it off or use a piece of microfiber or soft cotton cloth. Although there are numerous smartphone apps for guiding you through the golf courses, nothing beats golf GPS computers in terms of speed and location pinpoint accuracy. Virtually, any player on the field requires a golf putter for making the final hit to roll the ball right into the hole from a short distance. 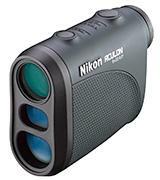 Laser rangefinder Nikon 8397 ACULON is a perfect choice for hunters. It’s great for anything from close to mid-range shooting. 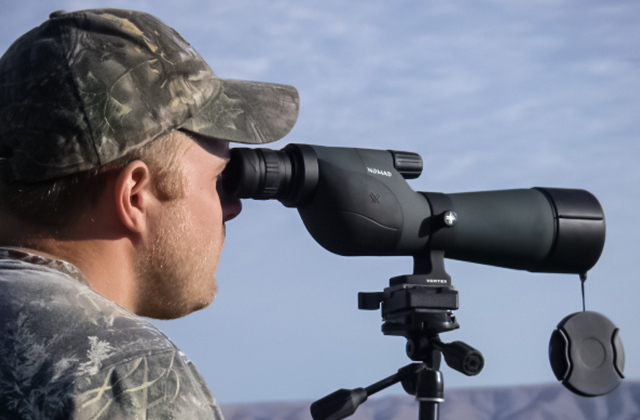 With operative distance from 5 to 550 yards, though not the highest among the others rangefinders in this review, this model is more than enough for hunting. 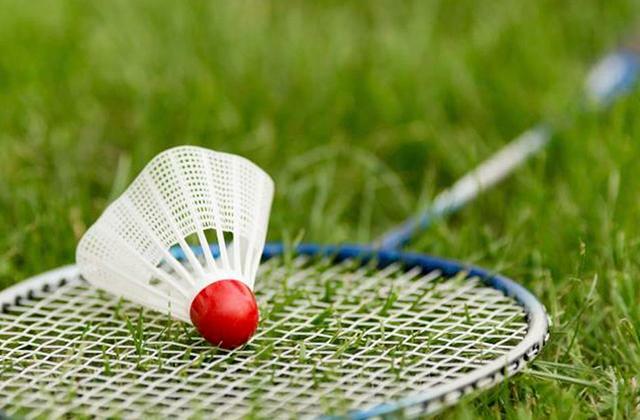 1-yard accuracy guarantees that you will put down the target with maximum efficiency. Although it was designed for hunting, nothing restricts you from using it for golf. However, remember that it's programmed for Farthest Target Priority. 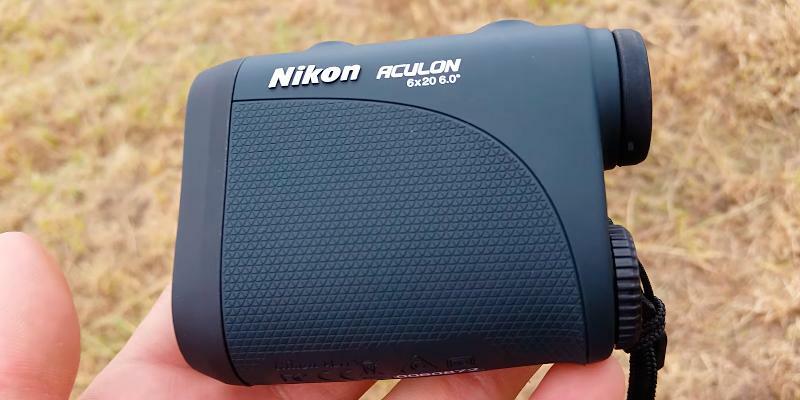 6х zoom in Nikon 8397 ACULON laser rangefinder is awesome for hunting down even the smallest targets from afar, behind rare trees or high grass. Great light transmission coefficient is achieved thanks to Nikon multilayer coating. And together with 20mm lens, light reflection is reduced to the minimum. The viewing angle is set at 6° and can show clear, wide part of terrain with many distinct objects right in front of you. Nikon 8397 ACULON rangefinder shows fine results in humid environments thanks to its water-resistant qualities. During rain or even snowfall, this product boasts high performance. Note that taking measurements is enabled by simply clicking a single button. 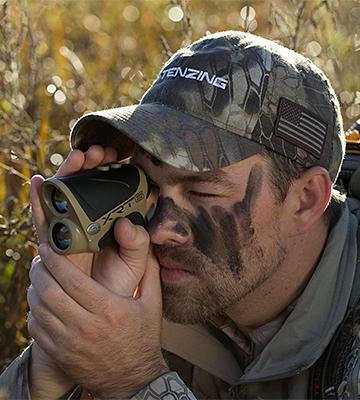 It’s vital to remember that hunting rangefinders are programmed to show the distance to the farthest target. This is extremely convenient when your target is partially hidden by high grass or leaves. 1 CR2 battery is required as a power supply. This Nikon rangefinder is also well known for its light weight (4.4 oz.) and small compact size (3.6" х 1.5" х 2.9"). That’s the real advantage in bow hunting when you want to be as mobile as possible. If you are looking for a universal solution, aim for TecTecTec VPRO500. 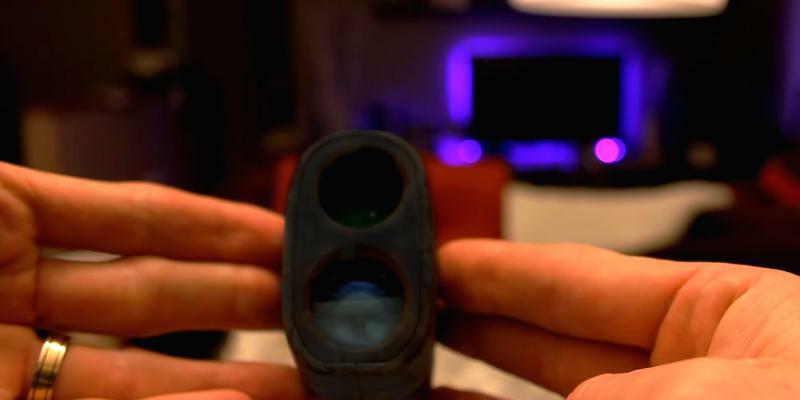 This laser rangefinder was designed with needs of both hunters and golf players in mind. Performance range of 5 – 540 yards is suitable for middle-sized golf courses and woody territories. 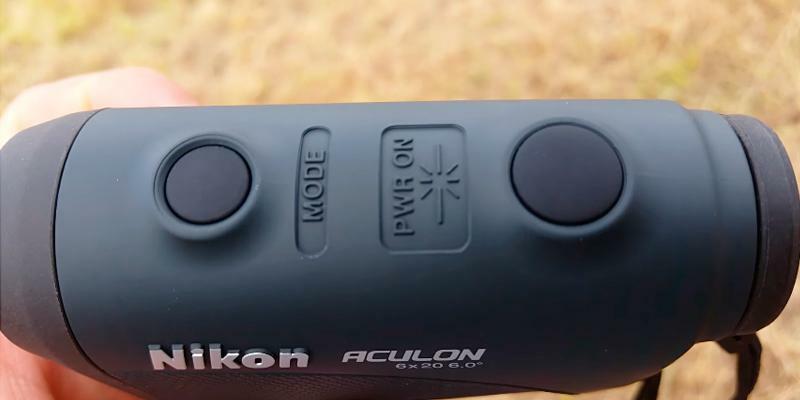 The accuracy margin is not budging an inch to other rangefinders in this review and has only 1 yard. 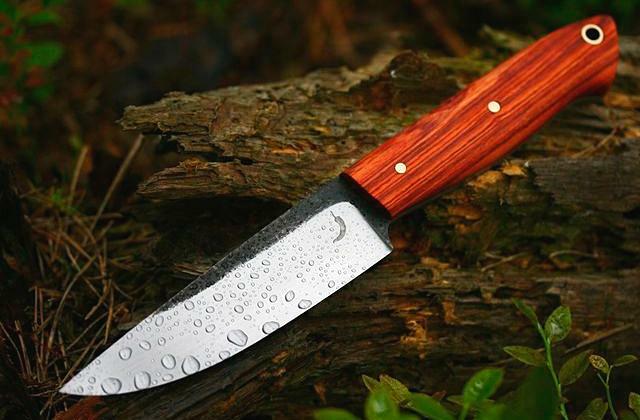 The best multipurpose choice for a reasonable price! 24mm lens with multilayered coating permits a lot of light through. Meaning, TecTecTec VPRO500 Rangefinder gives you a perfectly sharp and detailed image of the terrain around you even at maximum magnification. 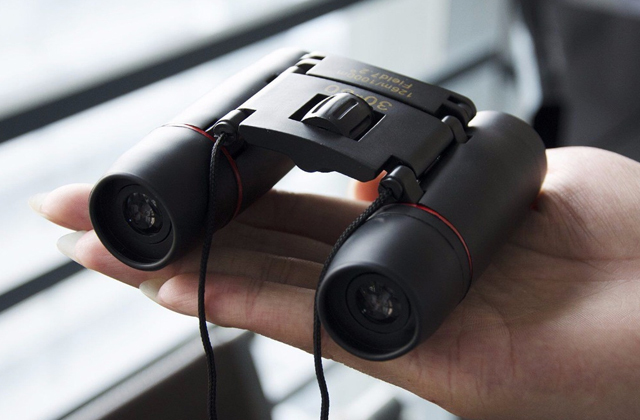 With up to 6x zoom and 7° angle of view, you get the freedom to readily catch the target during hunting or to pinpoint a flag during golf matches at any distances without much effort. The display also shows easy-to-read measurements and a battery level. You don’t have to worry about a harsh weather with this electronic rangefinder as its rainproof body prevents water and dust from getting inside. 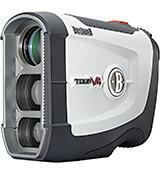 TecTecTec VPRO500 also has one unique feature that keeps it above other laser rangefinders. To be specific, you can switch between First Target Priority and Distant Target Priority modes for golf and hunting accordingly. Advanced PinSensor Technology comes handy if there are any obstacles between you and your objective. Neither pouring rain nor high grass will prevent you from hitting the target. The package comes with 1 CR2 3V battery and a carrying pouch. 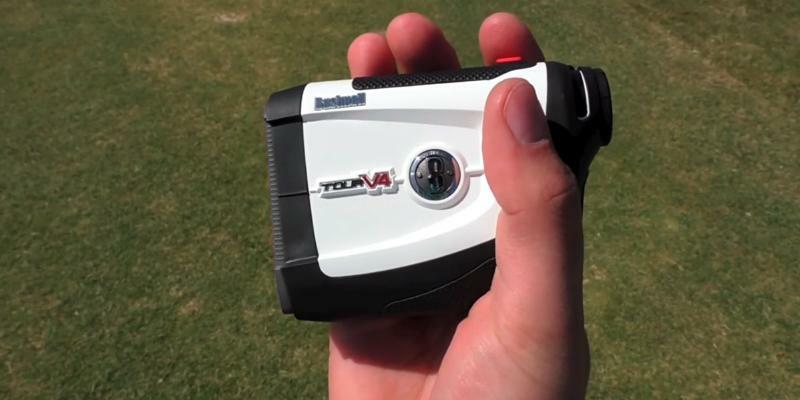 Finally, the TecTecTec VPRO500 rangefinder is a compact model at 4.09" x 2.8" x 1.6" inches that weighs 6.5 oz. without the battery. 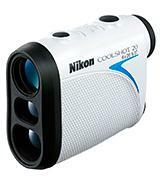 Nikon COOLSHOT 20 is a golf rangefinder with the operational range from 6 to 550 yards. With such a device, you can greatly improve your playing technique. Despite the average range, it’s more than enough for most golf courses. 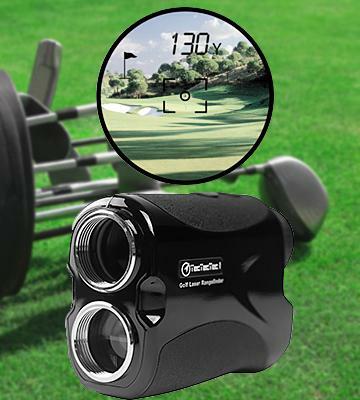 Accuracy margin is not higher than 1 yard, meaning that this laser rangefinder will surely increase your chances of getting hole-in-one! At a reasonable price, it suits both new players and pros as well. Optics has always been a strong suit of Nikon company. Stay assured that with this device you will get the highest quality lenses. Multilayered lens coating decreases light reflection, and 20mm diameter provides a detailed picture. A decent 6° angle of view captions a wide picture with all the hazards, trees, holes, and flags. Additionally, with 6x optical zoom you can examine the thinnest and smallest objects. 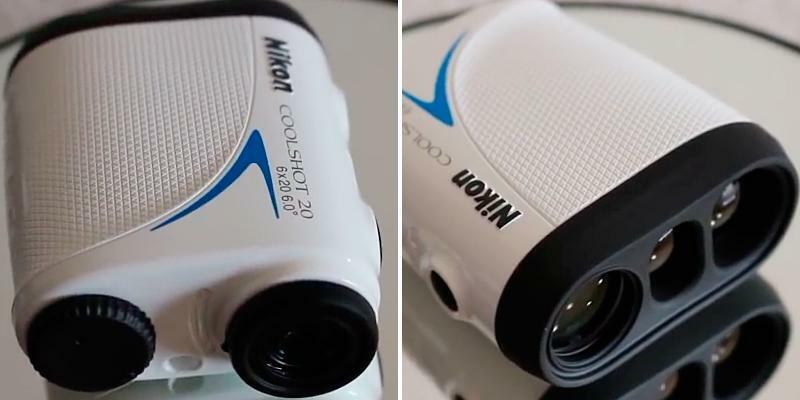 Water-resistant Nikon COOLSHOT 20 Rangefinder is powered by 1 CR2 battery and can be used in any weather conditions. First Target Priority means that laser rebounds from the closest object in a scanning range, eliminating any possible interference such as terrain features and hazards. With 8-Seconds Continuous Measurement technology you can search the distances to different objects in one go by holding the special button. At 3.6" х 1.5" х 2.9", this rangefinder weighs only 4.9 oz. 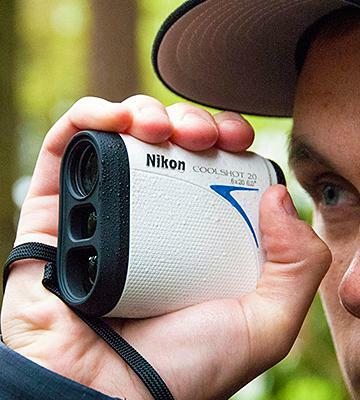 without battery, making this model the most light-weighted and the most compact among all of Nikon golf rangefinders. 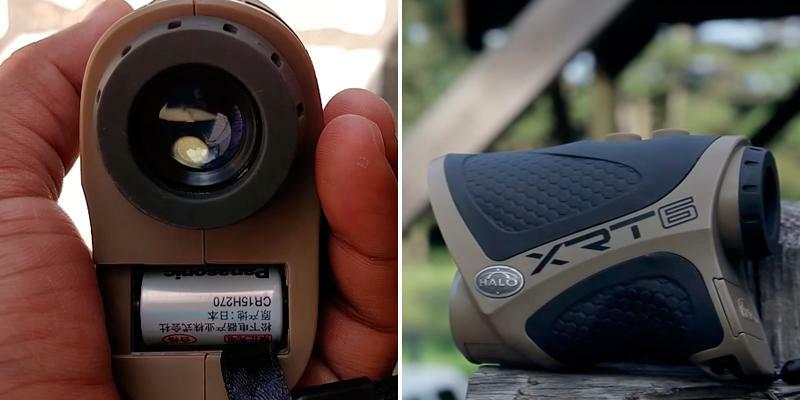 Halo XRT6 Laser Rangefinder is one of the long-distance hunting rangefinders for detecting the targets or animals from afar. It has a real good operational range from 5 to 600 yards. At this distance, you can effectively measure intervals to the targets, and you can also just visually search for animals that are further than 600 yards due to 6x magnification. High accuracy of only 1 yard should also be noted. 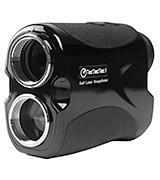 Although it is best suitable for rifle or bow hunting, you can use this rangefinder on golf courses as well. Lenses in Halo XRT6 hunting Rangefinder have decent stats with up to 6x zoom. Such magnification allows you to easily hunt down even the smallest prey. 24mm lens permits a lot of light, providing you with the highly detailed picture from the very large distances. 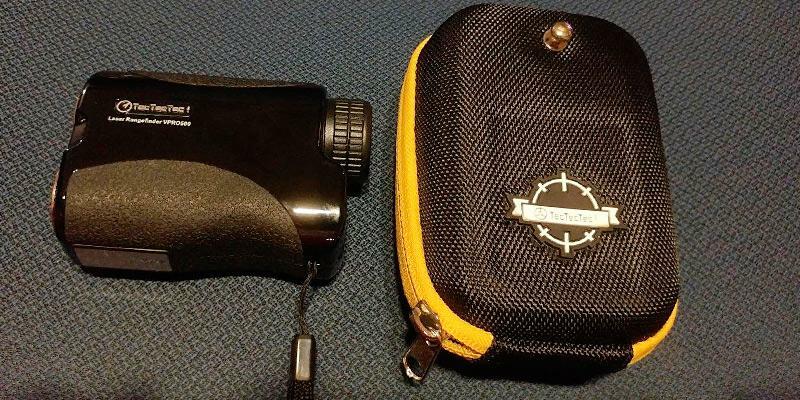 Furthermore, with such lens, you can freely use this laser rangefinder at dusk or dark environments. At 7° angle of view, you can see 366 ft width at 1000 yards. Halo XRT6 comes with an adjustable focusing eyepiece that will be appreciated by people with troubled eyesight. Extra features of this rangefinder include a water-resistant body, making it suitable for using in rainy and snowy weather. On top of that, Halo XRT6 rangefinder comes with a nylon case for transportation. 1 CR2 battery is enough for efficient working performance. And what’s more, the device is programmed to auto shutdown after 20 seconds of inactivity, drastically increasing the battery life. Another distinctive feature is a scanning mode for constant ranging. This means you can simply hold one button to measure a distance to different targets in a single session. 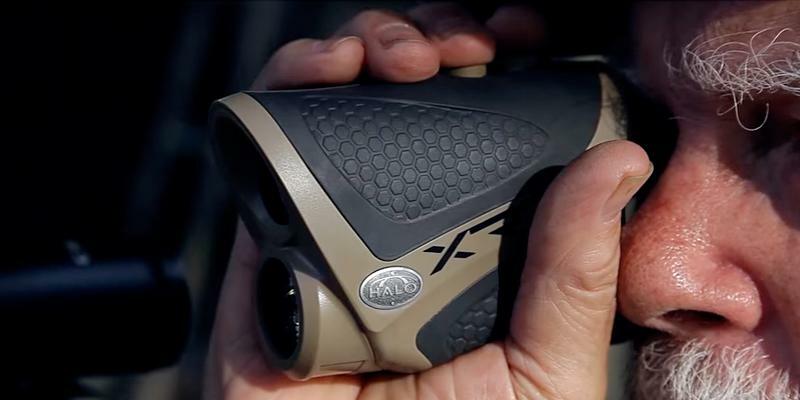 Halo XRT6 hunting rangefinder is a light-weight model at 4.9 oz. (without battery) and is easy to grab and hold in hand at only 4.2" x 3" x 1.7" in dimensions. 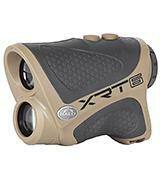 If you love golf or hunting, such equipment as laser rangefinders is a must. With it, you can increase your effectiveness during those activities. Modern rangefinders are special tools for viewing different objects from afar and measuring distances to objects. Optical rangefinders help figure out the precise distance, for example, to the hole or to the flag on the golf course. They are also really useful for hunting, allowing you to make a marksman shot. In this review, we have hand-picked 5 of the best rangefinders. 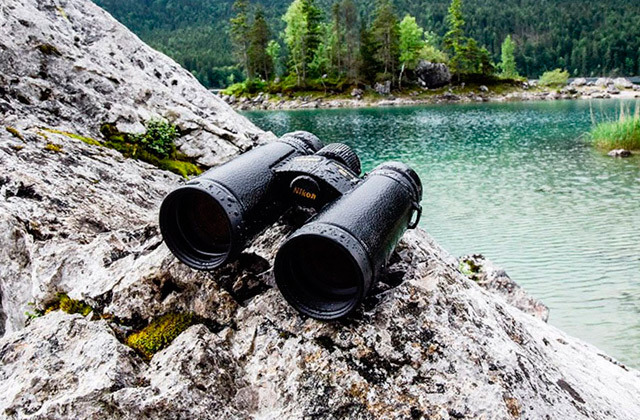 If you are looking for a similar device we can offer you our reviews of the best binoculars and monoculars as well. When tracking down the best rangefinder, first of all, chose the type of activity you’re gonna use it for. Today, there are different models of digital rangefinders: for playing golf or hunting, both with a rifle or a bow. Keep in mind that golf rangefinders have the close target priority because there is usually an open field between a player and a hole. Hunting models, on the other hand, have the priority set on the furthest target for ignoring trees or bushes between you and your prey. Another important feature is the maximum object finding range. The bigger this value is, the further distances to your target can be calculated. And if you are going to use it at close ranges, look for the minimal operating range. Accuracy is also important as it influences the precision of measurements. We picked up the rangefinders with accuracy no lower than +/- 1 yard. 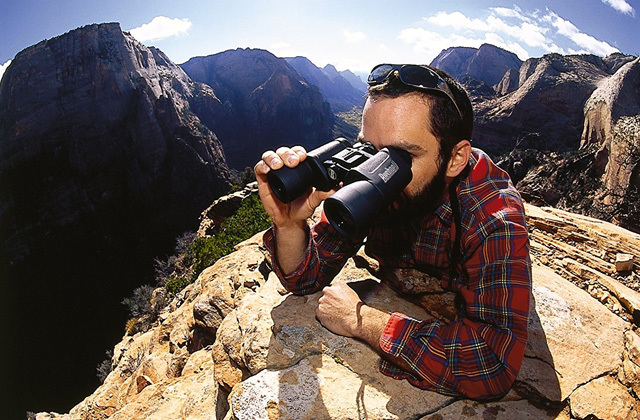 The next important parameters to look for in rangefinders are lens specs. Here the main parameter is the magnification. The bigger zoom is, the better view on the object you can get. 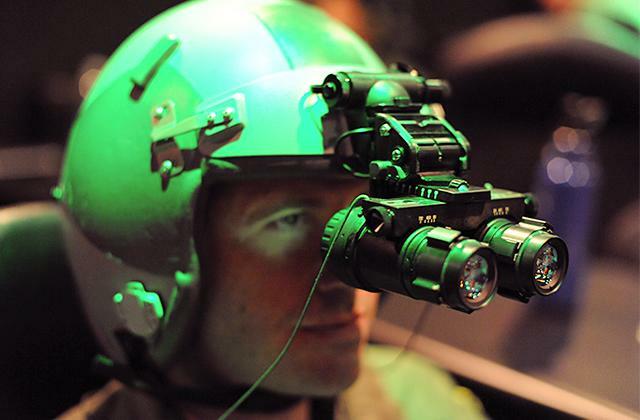 Laser rangefinders usually have 5-6x zoom. The lens diameter is important as well. 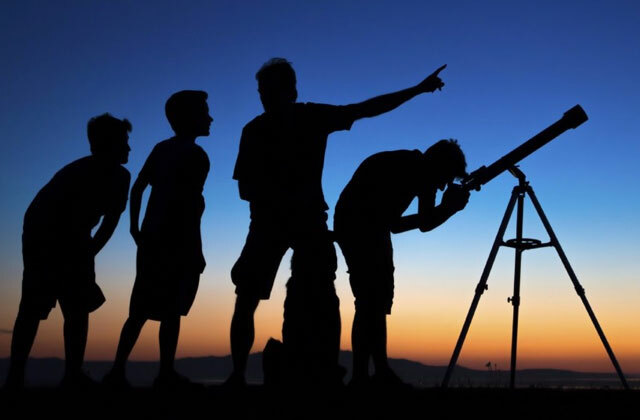 A bigger diameter permits more light, increasing the quality of the image in the eyepiece. If you are going to use the device at dusk, consider rangefinders with 24mm lenses and multilayer coating. Angle or field of view is another parameter to look at. Normally, it is indicated in feet/yards or simply in angular degrees. The angle of view determines how much you can see in your rangefinder. The higher this value is, the wider part of the world in front of you is visible. Finally, we’d also recommend you to look at extra features and power supply. Waterproof design will allow you to use the rangefinder in harsh weather conditions such as rain or snow. Some models have the option to change measuring units during scanning. 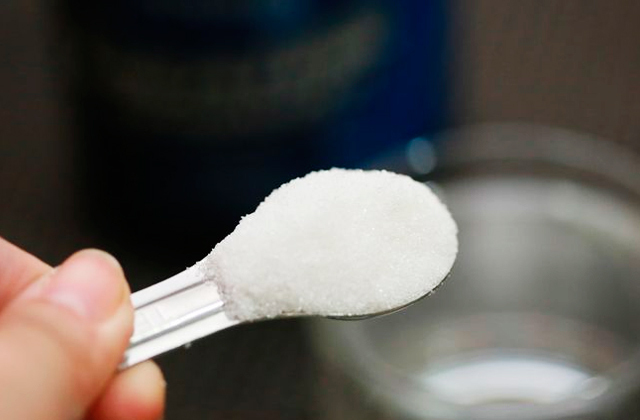 Automatic shutoff after a particular period of inactivity will save battery life. 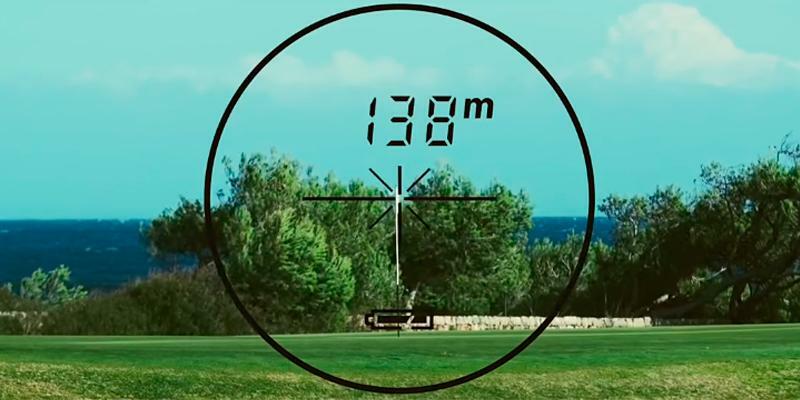 More advanced laser rangefinders even have continuous scanning mode that immediately shows distances to different objects – just point rangefinder from one target to another. 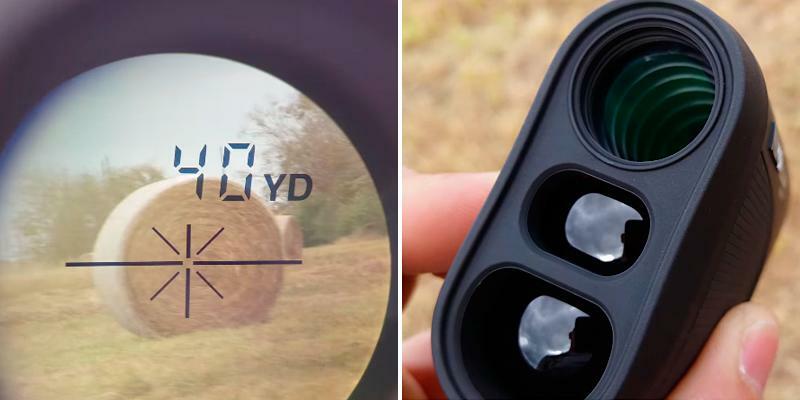 More functional rangefinders with special technologies can pinpoint distances even if there are small objects or raindrops between you and the target. Furthermore, certain devices produce a small vibration to inform you that measuring is completed, and others have a socket for a tripod for even more precise results. Additionally, there are special pouches and cases for safe keeping and comfortable transporting. 1 CR2 battery is the standard power supply for the rangefinders, however, a battery is not always supplied with the device. Last but not least, look at the size and weight of rangefinder as you are likely to carry it around for a long time. 1. Steven L How to Buy a Laser Rangefinder, OpticsPlanet. August 19, 2013. 2. Laser rangefinder, Wikipedia. January 31, 2017. 3. Patrick Meitin 8 Advanced Rangefinder Skills Bowhunters Need to Know, Realtree. July 22, 2016. 4. Marky Martin Improve Your Golf Game With a Golf Range Finder, Streetdirectory.com. 5. 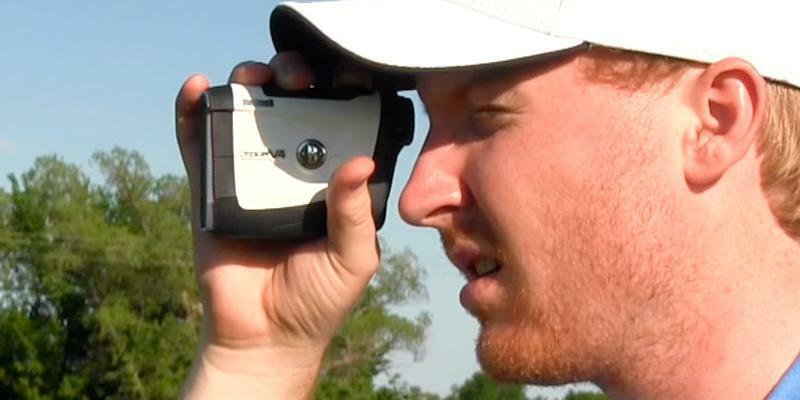 Mike Bailey Golf course navigation: Should you use a laser rangefinder or GPS on the course? Golf Advisor. August 12, 2015.